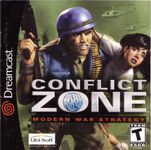 Conflict Zone: Modern War Strategy is a real-time strategy (RTS) game, developed by MASA Group and published by Ubisoft for Sega Dreamcast, Sony PlayStation 2, and Microsoft Windows in May 2001. The story takes place in early 21st century. The majority of the world's countries have created the ICP (International Corps for Peace), an organization dedicated to making global peace a reality. However, a secret organization called GHOST, defending only the economic interests of its members, does not hesitate to create crisis situations, threatening every day a little more the world’s balance.